Now I "just" have to edit the first book, while still working 12–15 hours a day on the second ... aaaaaah! Denise, if you produce miracles, they'll start expecting miracles. Once you figure how to walk on water, they'll want you to trot across the lake to fetch another six-pack. you are a word-processing wonder! God luck, and I agree, once you let them know you are a working wonder, they never let up!! 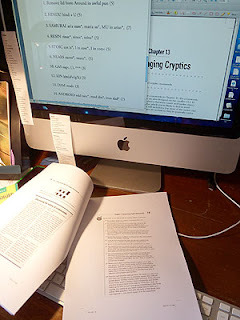 I have told them several times now that this workload is ridiculous, and that if we ever do Volume 2 of cryptics (which has been discussed), I need 3 months to write it in, not 6 weeks! I'm sure that, in general, editors have no idea how long it takes to write a page of puzzles vs a page of 'normal text' (about 6-10 times longer) so I presume their standard "How long an author needs to write an X-page long book" is seriously flawed for puzzle books!